The glitz and glamour of the regal ocean liners of days gone by sets the stage for Carnival Paradise's Majestic Casino. Located on the Promenade Deck (Deck 9), the Majestic Casino has Slots, Blackjack, Craps, Roulette, Bingo, & Texas Hold'em for your enjoyment. The Carnival Paradise also has Texas Hold'em tournaments (entry fee required) and has a progressive jackpot system on their slot machines with payouts that have reportedly reached over one million dollars. The Carnival Paradise casino typically operates any time the ship is in international waters. Gaming lessons are offered at the beginning of the cruise and the casino staff is always willing to answer your questions if you are trying to learn a new game. Guests under 18 years of age are not permitted in the casino. 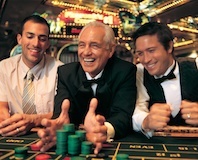 Guests must be at least 18 years of age to play the slots, the table games, and to purchase cards and play Bingo. Carnival Paradise cruises from $249The latest deals and best discounts on all sailings. Take The TourThe Carnival Paradise Tour saves you time and money. Photos & VideosExclusive video tours and photo galleries of the Carnival Paradise. Best Cabins AdvisorExperts help you discover the best (and not so good) cabins on Carnival Paradise. Cabin Category GuideCarnival Paradise cabin category differences explained in plain english. We will e-mail when there is a change in price on this Carnival Paradise cruise. You can unsubscribe at any time.